Fill 'er up with Christmas Joy! Back in the day when I first reviewed Bell’s Porter, I found nothing about it particularly appealed to me. It was icky. I’ve been reluctant ever since to try another Bell’s beer. 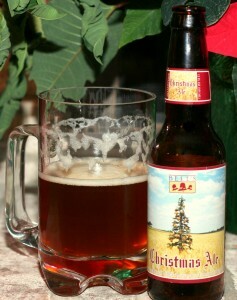 The Christmas Spirit, though, has melted my cold heart and led me to Bell’s Christmas Ale. This is a fine Christmas Ale sure to make your holiday season a little brighter! It’s hard to tell from the picture, but on first pour Bell’s Christmas Ale had nearly a two inch foamy head, and a thin foamy layer persisted while drinking. The malt that makes it nice and foamy almost fooled me into believing this beer is sur lees like a wheat ale. Instead, thousands of fine malt bubbles filled the glass causing a cloudy appearance, and provide a little bite to my tongue. Although, Larry Bell the founder of Bell’s Brewery has vowed not to filter the life out of his beers – so I might be wrong. Like many Christmas ales, Bell’s was rich copper, but lighter than any I have had before. There’s a hint of gold in the copper (maybe it’s tinsel) that makes this beer shine just a bit. Again, I didn’t capture it in the picture (click on the picture to see a larger image). This beer is not a s rich as many of the other Christmas ales I’ve had. Its spices are more subtle, and definitely won’t overwhelm the average beer drinker. The beer snobs will enjoy it just the same. This beer also lacks the bitterness found in many craft beers. In fact, I would say it verges on sweet. Maybe that is what takes some of the edge away and mellows it. Bell’s Christmas Ale is a very good Christmas ale. It is competing with Great Lakes Christmas Ale to be my favorite. Both will be in my refrigerator (and belly) this Christmas season. Be sure to check out Bell’s website too. On every bottle of Bell’s beer there is a batch number. On Bell’s site you can look up the batch and bottling date. It’s nice to drink fresh beer! Merry Christmas!